Recap by KC Forcier, the 2018-2019 Graduate Liaison for the Art, Technology, and Culture Colloquium. Terraforming: (especially in science fiction) transform (a planet) so as to resemble the earth, especially so that it can support human life. 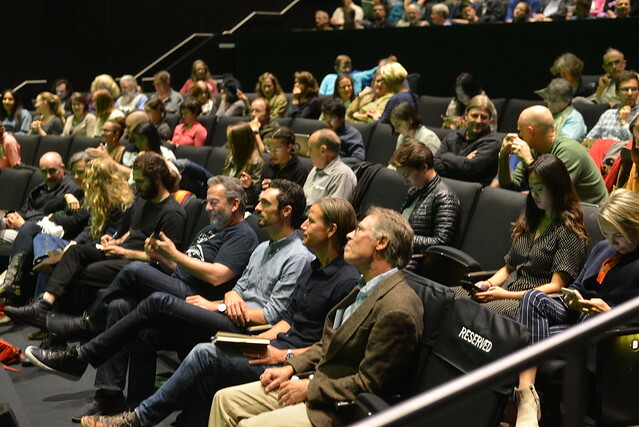 “If people read enough science fiction they have a sense of the future as a possibility space.” This observation, made by Kim Stanley Robinson at the most recent Art, Technology and Culture lecture, explains why the author, who has spent a career imagining the future in numerous celebrated novels, can be simultaneously fearful and hopeful about the Earth’s future. In his much-beloved Mars trilogy, Robinson envisioned humans transforming the red planet into an environment that could sustain human life. In reality, Robinson suggests, we should be concerned with how we might terraform our own planet in order to prevent the disasters of unchecked climate change. The “Anthropocene” is a concept growing in popularity to describe the Earth’s current age, in which the very geologic record of the planet is indelibly changed by human technology. While there are debates about when this new epoch may have begun - some claim the atomic bomb, the industrial revolution, or the European colonization of the Americas - Robinson believes there is still time to decide what the Anthropocene will ultimately mean for the planet. Will the way humans alter the geological record of the planet lead to mass destruction, or will we be able to make a positive impact? “If we run the good Anthropocene, if we correct our relation to the biosphere, it could be that the Anthropocene could be cancelled,” said Robinson. The “good Anthropocene” is one in which we acknowledge that while humans irrevocably alter the planet, we can harness our technology in service of supporting all life on the planet sustainably. Many of the examples he cites are familiar and practical, such as a proposed “Green New Deal” agreement by which 1.5% of every nation’s GDP is swapped from dirty to clean energy. Similarly, promoting equal rights for women could help prevent ecological collapse: when women have access to education, labor, and healthcare the population drops. Some of the endeavors to terraform Earth sound straight from the pages of a Robinson science fiction novel, such as solar radiation management, a controversial engineering project that would reflect sunlight to prevent deadly heat waves; or a massive pipeline to pump the rising sea waters back up to the polar ice cap. While Robinson believes it still is possible to prevent irreversible disaster for our planet, he observes that every year this gets harder. He advocates for taking the long view: “We can’t get discouraged by this year, or even this current political cycle. The ICC says we have 20 years, which is fast, but it isn’t inhumanly fast. Elections happen every year.” Yet, he urges that we must work for these changes in our relationship to the biosphere even if we know we won’t see it accomplished in our individual lifetimes. “We need to persist. Some endeavors take generations, like building a cathedral…” he observed. As a science fiction writer, Robinson is an apt advocate for using science to engineer a better future. In describing the political role of science fiction, Robinson asserts: “We are all science fiction writers of our own lives. Any story set in the future is science fiction.” We can either take a dystopian view, or, as Robinson urges, we can be utopian in our view of the future for ourselves and for the planet.